Let me just start off by saying that Worst of Beauty 2015 is quite an extreme title. These products aren't necessarily bad, they just didn't work for me and I found them to be disappointing. I have nothing against this primer other than the fact it didn't work. It didn't make any difference to the appearance of my pores and it definitely didn't make my makeup last longer. All in all, it wasn't very effective for me. The texture is slippy and silicone based which is exactly what I expected so I can't say that was disappointing. It simply did nothing for my skin. Another primer bites the dust. I had a sneaky suspicion when purchasing this that it might not work out because it's essentially a white liquid. White liquids and medium-dark skin tones doesn't tend to go well because they make the skin looks ashy. This primer is a prime (pardon the pun) example of that. It does offer a bit of luminosity, but not enough to counteract the ashiness. That being said, this would be fine applied to the high points of the face and would work well for fairer skin tones. 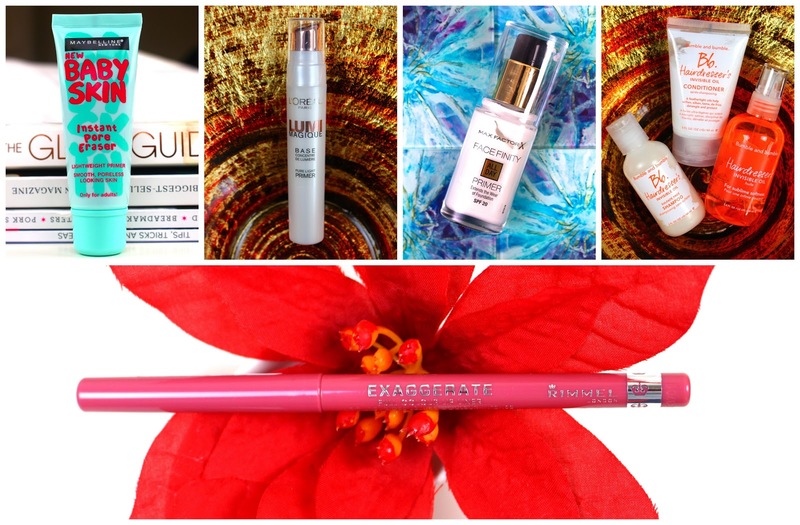 It would seem that 2015 was the year of primers. I did not get on well with Max Factor's Face Finity Primer. It makes my skin look dull and ashy and it was really difficult to blend in my foundation on top, even when I used my Beauty Blender. It also smells very chemically and that scent doesn't really go away. This is such a hyped about product so I feel a little guilty about not liking it. Don't get me wrong, I love the colour. It's a gorgeous natural mauvey pink but the formula, I really really don't like it. It's very dry and crumbly yet it applies very thick and heavy and exaggerates any flaws on the lips. I've tried applying it from the pencil, with a brush, with a balm, with a gloss and with a lipstick. I just can't make it work. It's a real shame because the colour is beautiful. I'm really glad I got a set of this in the sale because I would have been gutted if I'd spent £30+ on it. The shampoo left my hair squeaky clean, but by the next day, it needed a wash. The conditioner is nice but it doesn't wow me, and at that price point, it needs too. The hair oil was simply too heavy for me and I much prefer my L'oreal Extraordinary Oil. What products disappointed you in 2015? Aah shame you didn't like Eastend Snob, it's one of my favourite lip liners! I've never tried any of those primers, but recently I've been using Nivea Post Shave Balm for primer. It sounds a but weird using a mens shave balm for primer but its actually one of the best primers I've ever used! I know! I'm gutted because it's such a stunning colour. I've heard about using men's shave balm as a primer before but never really given it much thought. I'm officially intrigued! Have you got a post on it?